Amplifiers. Musicians. Opinions. Infinite combinations. Put the same amp in front of 50 different musicians and you’re not likely to get the same opinion twice. That’s OK. Some folks like gut strings, others like nylon. Some folks like Fenders, some folks like BC Richs… you get the idea. The point of my review is not to take an opinionated stand on this particular amplifier. Rather, the point of this writing is to tell you what my V-Series makes me feel and hear. Ultimately, however, you should trust your own ears and wallet. You are your own best judge, even novice, even lofty professional. Music is wonderful and the more colors we introduce, the better. There was a need to consolidate the amps in the house down to one amp. Some were too big, some were too small, some didn’t sound like what we wanted… So, I sold them all. And I bought one amp to serve our (my son and me) needs. I don’t recommend this approach, but it was useful for us from the standpoint of housing space and underlying need. Quick Opinion: The lower-end V-Series Crate Tube amps are a bargain. They’re becoming scarce to buy in stores, so if you’re interested, play one very soon, or find an online store willing to take returns. These aren’t the high-end USA-made Crate tube amps, but they’re still Class-A, and you can tell it. 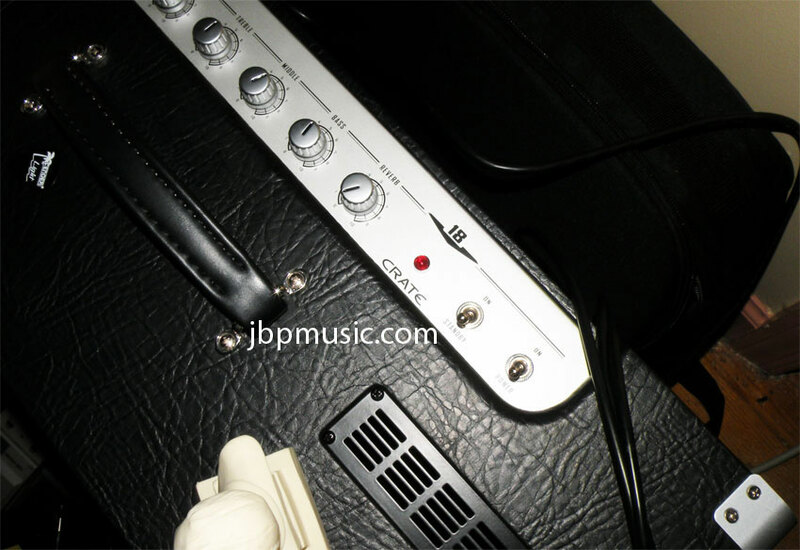 Interestingly enough, depending on which combo (or head) you purchase, you get different types of power tubes – something like a Fender in a couple of models, something like a Marshall in a couple of models. If you can play several side-by-side, let your ears decide. If you’re looking for a particular sound, read up on the power tube types. We love our V18 212. It’s moderately heavy (about 50 lbs, nicely balanced at the handle), it’s loud as a pissed three-year-old, and it has a good fundamental sound. I’m happy with out decision and my experience with this amp has made me contemplate augmenting my studio room with a little V5 combo for when I’m comping. The inclusion of a standby switch is awesome. It lets you keep your tubes hot while you silence things in standby for breaks, instrument switches, pedal-foreplay, and other shenanigans – you don’t have to shut down and re-blaze your tubes every time you need to fiddle with things on the other end of the cable. Very nice touch for an amp at this price point. 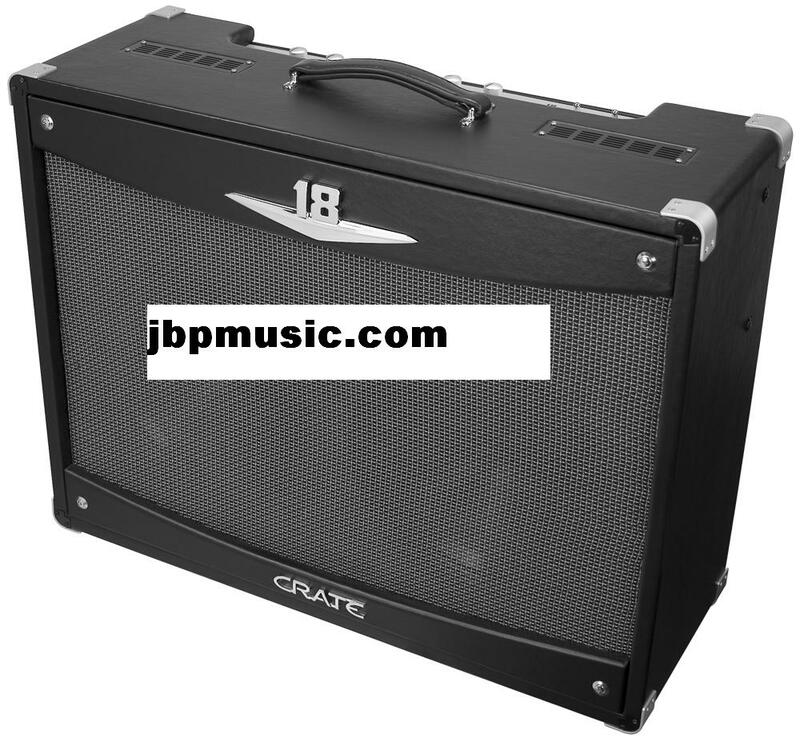 Features: As an inexpensive Class A tube amp, the Crate V18 is actually pretty nice. It has more than just volume or volume and tone (as its price-wise competitors are built). It has a real reverb, three bands of EQ, and drive to go with the volume. 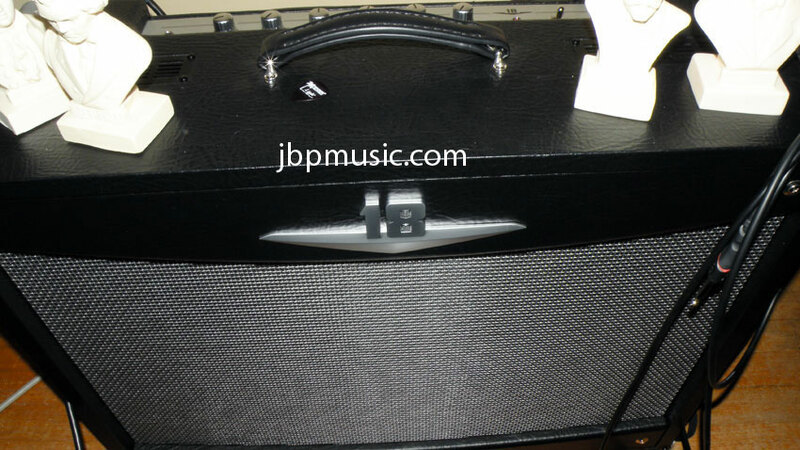 Our particular V18 is a combo, and we opted for the 2×12″ model. The pair of Crate-branded speakers are fairly run-of-the-mill, but they suffice. This is a one-channel amp. There is only one input. These things are not unusual in this price range, but it’s important to point this out. Two-switch actuation mode (on and standby). Quality: Our experience with our Crate V18 has been excellent. The tubes seem to be just right in their quality and adjustment. The Speakers are just what you would expect from ceramic-magnet 12s, the control quality is quiet, smooth, and feels good. 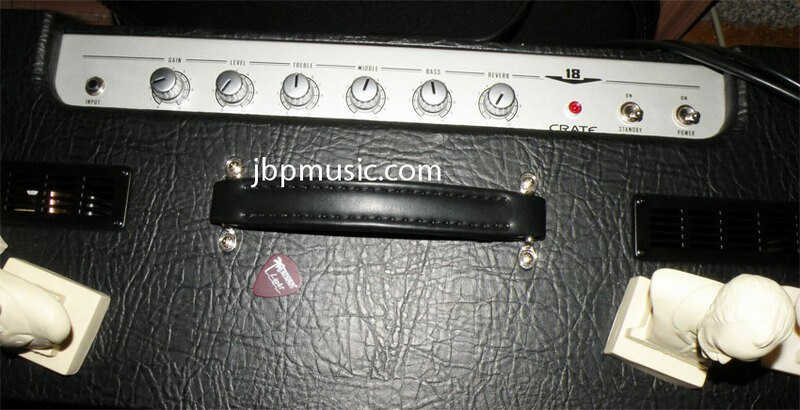 The tolex covering and the overall fit-and-finish is just fine. The cabinet seems decently tight and well-assembled. The corner protector covers are nice and big… and the screw-down parts seemt to be pretty good. Our V18 has been lugged around by teenagers quite a bit. Everything still works great, there are few tears in anything, and the sound is still very, very good. Playability: Well, as an amp, playability is really not the big thing to review… but… it’s easy to position, the knobs are easy and intuitive, and the tube-warm-up time is reasonable. The standby switch is a great feature and makes this budget amp a top contender. Sound: Here’s where the speaker hits the air and ear. The synopsis is this: the sound is Marshally, the spring reverb is actually pretty good but can get overloaded (not quite sproingy like you get on a nice $800 Fender tube amp). It’s easy to over-drive the tubes and start crunching away. There is no quiet setting, and there is no clean sound unless you turn the gain all the way off – thereby compromising the volume almost completely. But, I love playing it in overdrive! If you are looking for clean, these are not the droids you are looking for. Move along. The long version: This amp is really crunchy and tubey for $199 (It’s 2008 street price when it was still available new and was a “closeout” model). It sounds much better than its price and it really delivers as a low-cost small-gig/recording amp. If you’re rockin’, bluesin’, or doing some crunchy country, this amp delivers in a big way. You can even play it without an overdrive pedal at low volumes to get some nice tube distortion. Some might find the sound a bit brittle at some settings. Really, the right way to approach this amp is to plug in your guitar, and dial in the different aspects until you like it. I’ve never seen an amp that sounds great with every guitar at every setting. I warm mine up with an Analog.Man pedal and a nice small device chain (wah, chorus, delay/echo). I’m very happy with this amp at any price under $300. It sounds loads better than most solid-state amps even up to those in the $500 range. It’s a nice alternative to solid-staters for crunch delivery and guts. Value: This amp used to have a street price of about $300. It was worth it then… Although the occasional discount was nice. Now that these sell for (typically) $199, they’re a steal – a bargain – a smart and easy choice. Think about it… at peak gas prices of 2008, that’s really only two tankfuls for a large vehicle ;-). 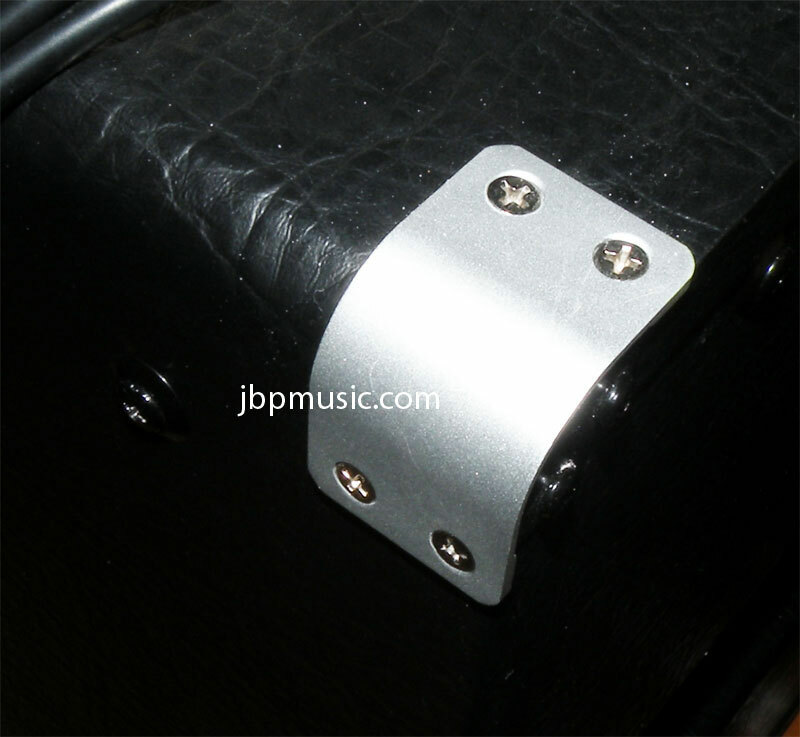 Wishes: I’d like to see a built-in attenuator and a means to get more clean-channel sound out of the amp. Crate: Clean is important to lots of buyers.